This paper aims at providing a novel approach to modeling and controlling soft robots. Based on real-time Finite Element Method (FEM), we obtain a globally defined discrete-time kinematic model in the workspace of soft robots. From the kinematic equations, we deduce the soft-robot Jacobian matrix and discuss the conditions to avoid singular configurations. 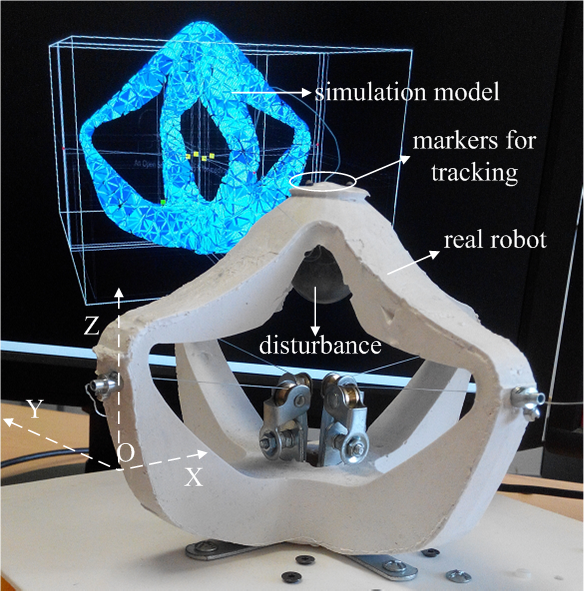 Then, we propose a novel observer based control methodology where the observer is built by Finite Element Model in this paper to deal with the control problem of soft robots. A closed-loop controller for position control of soft robot is designed based on the discrete-time model with feedback signal being extracted by means of visual servoing. Finally, experimental results on a parallel soft robot show the efficiency and performance of our proposed controller.